Tourists are evacuated from coastal areas of Vietnam after heavy winds and lashing rain that have killed dozens and destroyed roads and buildings. 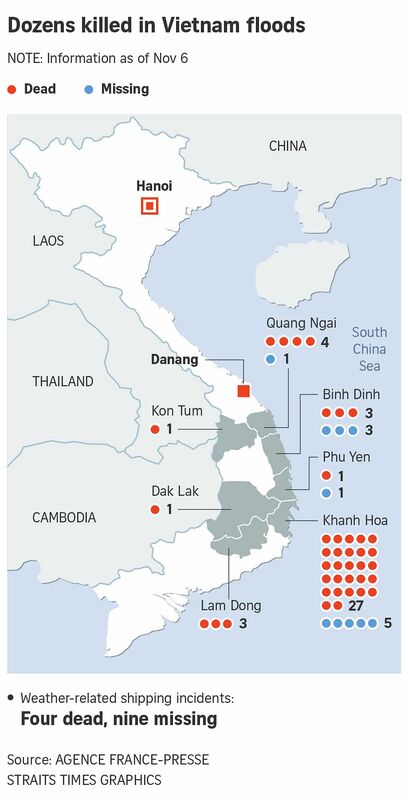 DANANG • At least 27 people have died and nearly two dozen are missing after Typhoon Damrey barrelled into Vietnam, the authorities said yesterday, damaging tens of thousands of homes and submerging highways days before the country welcomes world leaders to the Apec summit. The storm, which made landfall last Saturday, is the worst in decades to strike the country's southern coastal region, an area normally spared the typhoons that typically hit farther north. More than 40,000 homes were damaged as heavy rain and 130kmh winds tore through the area, leaving 27 dead and 22 reportedly missing, according to the disaster management office. More than 30,000 people, including tourists, were evacuated ahead of the storm. Photos showed residents wading through knee-deep floodwater in several cities as toppled electricity poles and trees blocked roads. Some 300 ships were wrecked, according to the government, while the local authorities said Phu Yen province's Tuy Hoa city had never suffered such devastation before. There were also reports of lesser damage about 500km north in Danang, the coastal city that will host the Asia-Pacific Economic Cooperation (Apec) summit next weekend. A local resident said strong winds and rain had torn down signs promoting the Apec gathering, which will bring together leaders including United States President Donald Trump and Chinese President Xi Jinping. An hour's drive south in Hoi An, an atmospheric port city and popular stop on Vietnam's tourist circuit, a local resident said floodwater was up to 1.5m deep in some parts of town. "Foreign tourists were transferred by boats to hotels in higher areas," she added. The spouses of some Apec leaders are scheduled to visit Hoi An next week, according to the Culture Ministry. Vietnam has been pummelled by a dozen major storms since the start of this year. Some 80 were killed in the weeks after Typhoon Doksuri battered Vietnam's central provinces in September, destroying thousands of homes and triggering severe floods across the affected region. The World Bank said natural disasters have killed more than 13,000 people and caused more than US$6.4 billion (S$8.7 billion) in property damage to Vietnam over the past two decades.